The sun doesn’t set perfectly behind the Niagara Falls. The dream image of a perfect sunset along side the majesty and might of the Niagara Falls essentially can not be captured. Its geography – the sun sets in the west. 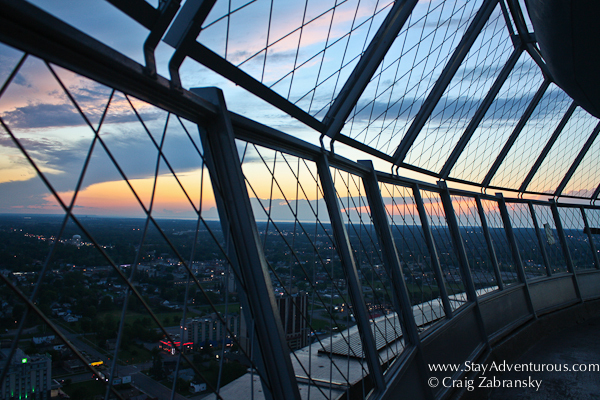 But for visitors to Niagara Falls, the Skylon Tower on the Canadian side of the border is one of the best places to see both the waterfalls and the sunset. Taking the elevator 552 feet up to the observation deck at the Skylon Tower allows visitors to see the impressive and powerful waterfalls from above and also capture a complete 360 degree view of the town at Niagara Falls. So besides the images of the American Falls, the Niagara River, and the Horseshoe Falls, I also captured a few images of the sunset. And on my walk around the observation deck I discovered I was not alone either. The views of the Niagara Falls are impressive from above (see link for 360 views) and I recommend a visit for the views, but strictly for the falls, I enjoyed being closer (and getting wet) on the Maid of the Mist and the Journey to the Falls. But with the opportunity to see all of Niagara Falls (the town), enjoy a sunset and then stay for the illuminated waterfalls at night (and fireworks on Friday and Sunday nights) it’s definitely a great way to spend some time on your holiday to Niagara Falls. However, to capture it all you might be up there for over an hour and there are no seats. 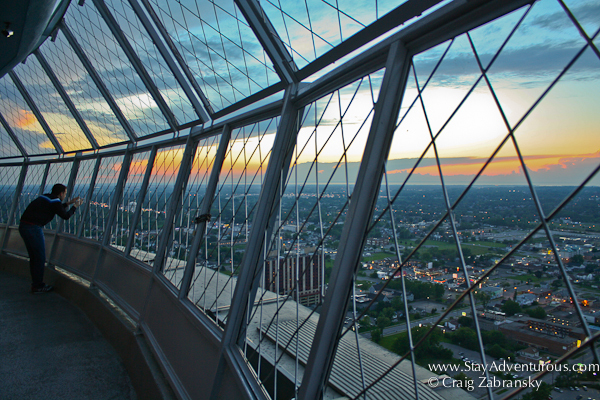 A special thanks to the Niagara Falls Tourism for not only recommending Skylon Tower for a sunset, but also providing passage to allow me to experience it. Very cool space for a 360 view… and sunset watching.